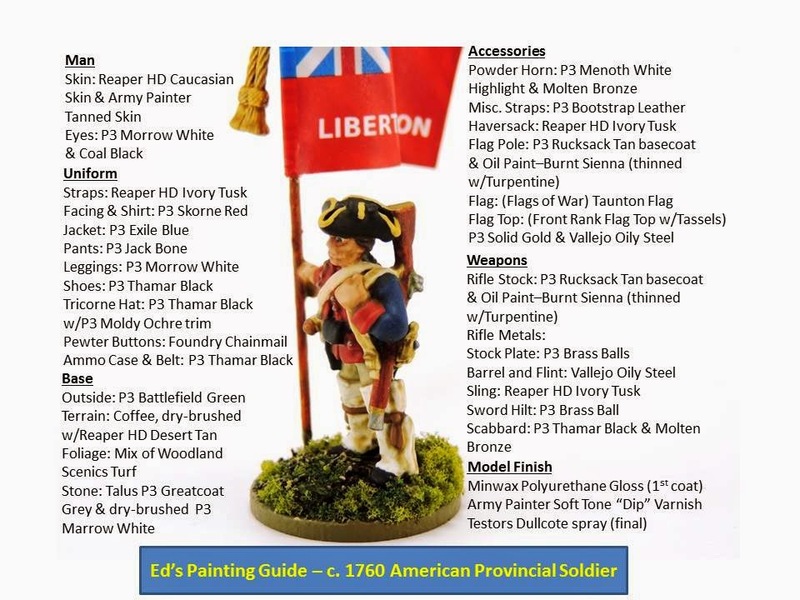 Ed's blog for modeling & painting using high-quality 28mm plastic and metal figures from various UK shops and miniatures Wargaming via EIR "Hail Caesar", FIW "Muskets and Tomahawks" and WWII Op Market Garden "Airborne"! I thoroughly enjoyed researching before I began painting. It is a good change up from my standard Early Imperial Roman painting. 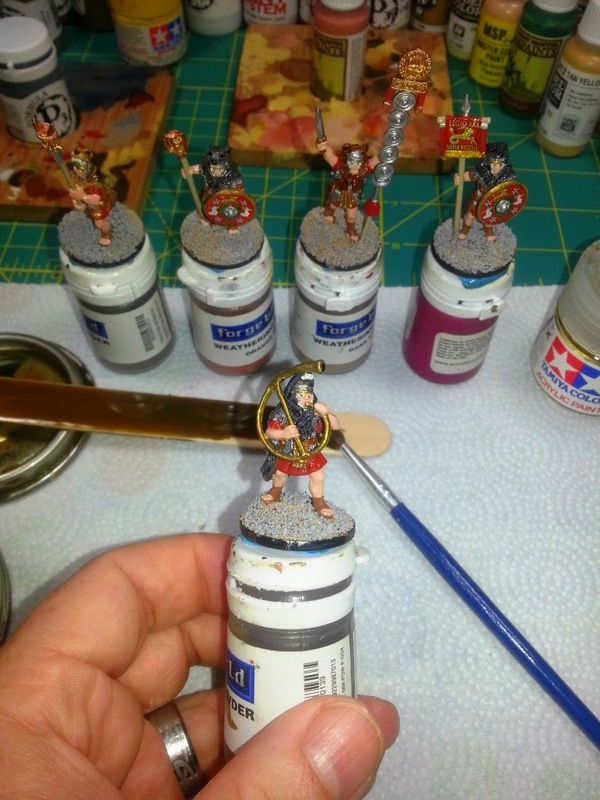 Although I have to admit -- much harder painting these, as all the straps and complexities of the uniforms. The 28mm metal figure itself is outstanding and I really look forward to painting many more by Lance at GM. Enjoy! About the flag: The flag is the Taunton Flag from Massachusetts. It represents a key desire of the time period for the Colonies to remain loyal to England, but at the same time enjoy Englishmen liberties and status (e.g. taxation with representation). The flag itself would come into being around this time as the Americans began to think about breaking from England. I like the flag a lot, it is very well done by Flags of War. I simply used thinned PVA glue with a strip of heavy-duty aluminum foil inside to hold the shape and then attached it to my metal wire flagpole. The top is from Front Rank Figurines (flag top w/tassels). 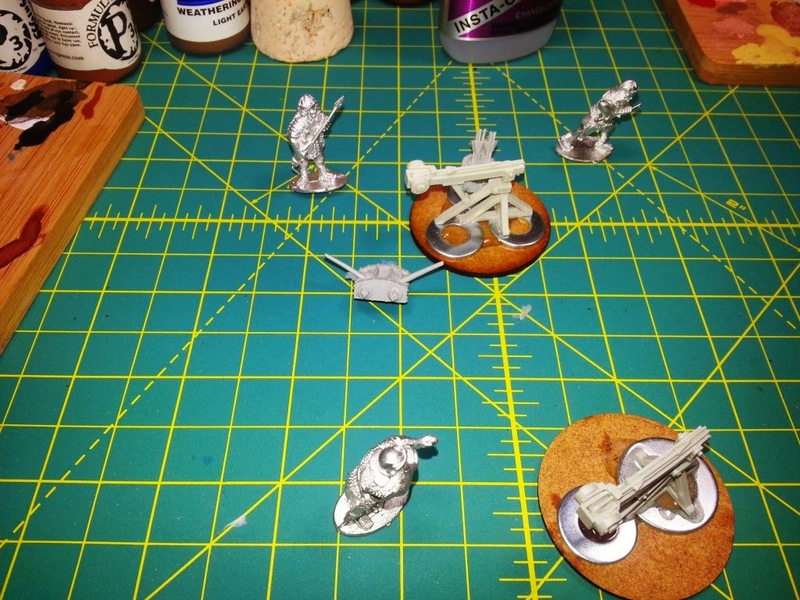 The base is 2mm thick MDF, cut in a 25mm circle base and as always it's from the great folks at Warbases UK. 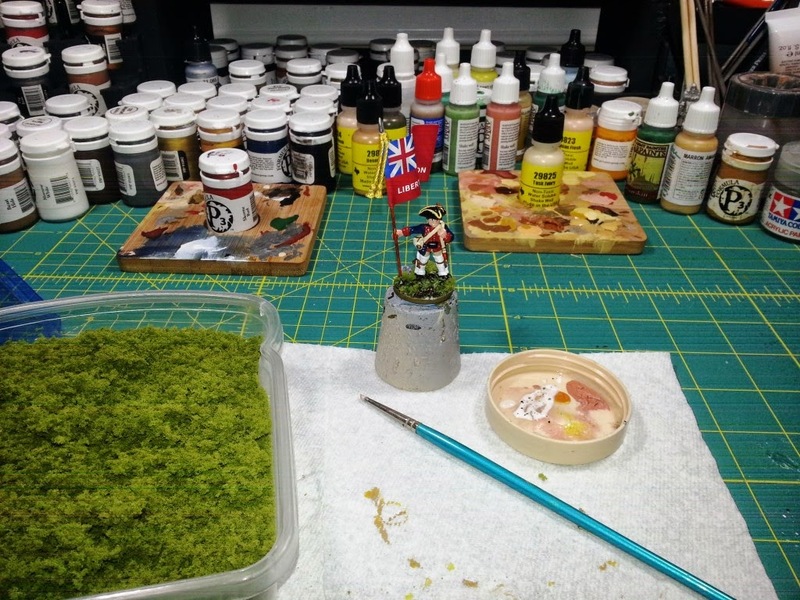 I switched up my basing style some to represent FIW battlefields of the northeastern US and used coffee as my base filler versus my standard model RR ballast and fine grit mix. I used dried spices as leaf debris and the foliage is standard Woodland Scenics Turf. I primed using grey instead of my normal black as I wanted the colors to remain on the brighter side. I used Tamiya's Fine Primer Spray which I really liked. 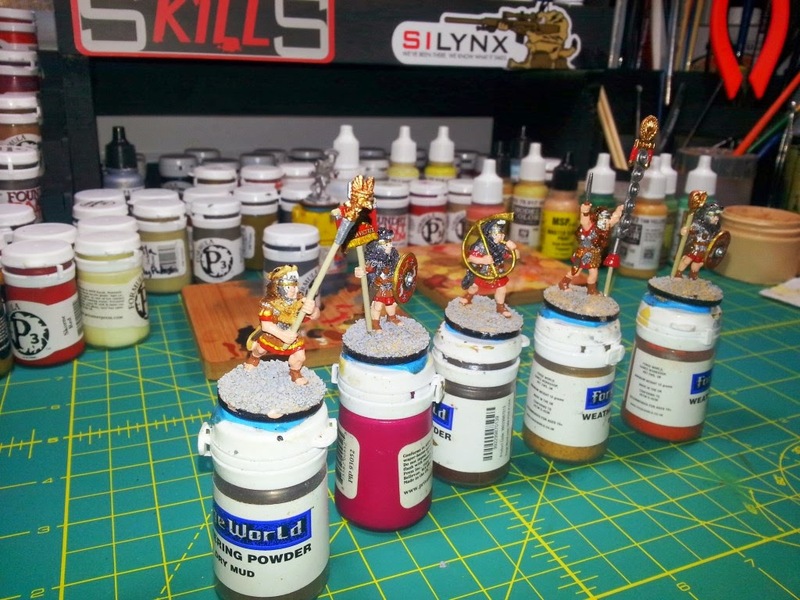 Lots of new color selections over my Romans which was fun and Osprey's book series of the French and Indians War offers lots of good examples. 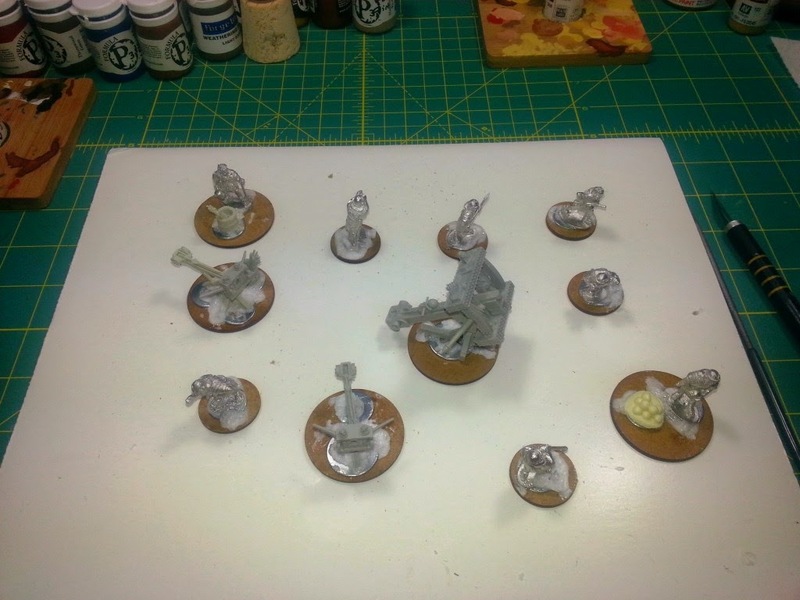 Breaking Down Boxes: FIW Minis Arriving! Lots of boxes in the mail this week after I returned from almost 2 weeks of steady travel for my job. I have boxes from several new mini model shops for me as I start my new French and Indian War painting and wargaming efforts. 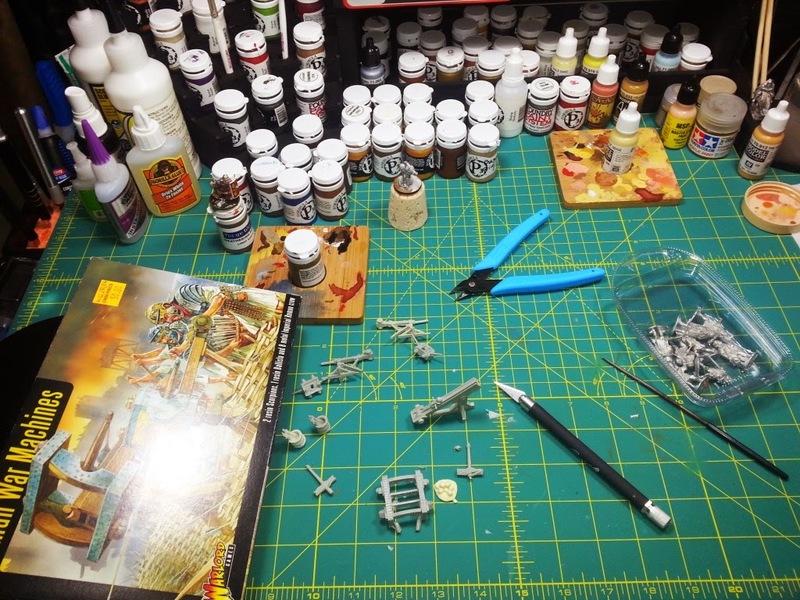 The work bench pic above is a rough comparison -- the right two figures are Conquest Miniatures' Indians, the middle two are North Star Figures' Indians and the left two are Rogers' Rangers from Galloping Major (GM). I think the North Star and GM minis match up well and the moldings are well done. Box break down day is a big deal for me...as its always a question mark here in the US for inbound Royal Mail from the United Kingdom. I've had at least one Foundry box lost and several others delayed for almost a month, meanwhile some packages from the UK arrive in less than a week. Crazy mail! When I order my first Perry figures I may try Triangle Miniatures as they are based in North Carolina and remove the import time hassle. However, they have limited product lines and don't carry many of the model makers I like. My Galloping Major Wargames Rogers' Rangers unit minis arrived! They are really well done minis. By purchasing the large Ranger unit package they added a few free minis in the box which is always nice. I really like these as my first French and Indian War figures, I did a lot of research before ordering for this era as my next theme. They are on the 28mm bulkier size and are well "animated" (which I like both of these factors), so I will have to be careful moving forward with additional purchases to match up with these. North Star Muskets and Tomahawks figures also arrived. I like these Indians and they match the size of the Galloping Major Rangers very well. I have just ordered North Star's Highland Scots unit and some additional Indians based on this un-boxing and match up. 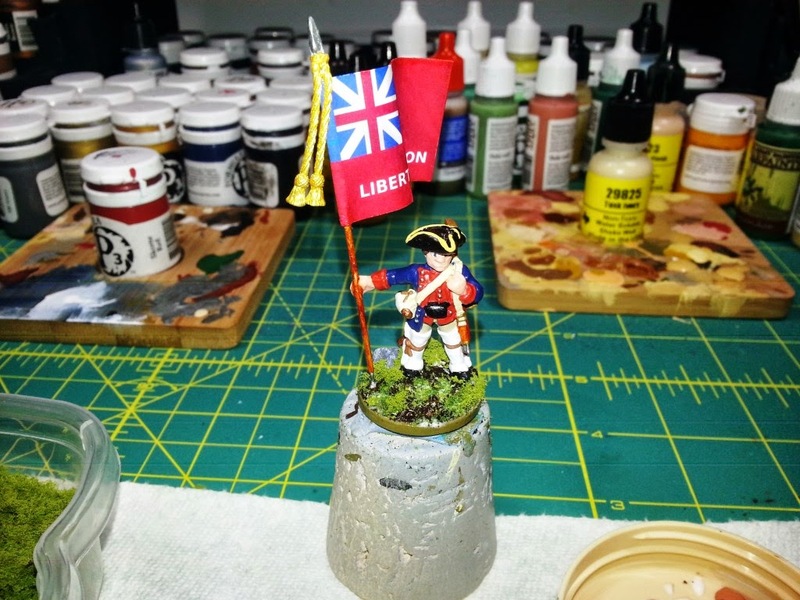 I think Redoubt's miniatures would work, but pics of them available online via a Google search don't impress me very much, they just look "fat" and uneven with poor face and hand casting. Perhaps I need to order a few and see up close. Conquest Miniatures purchased from eBay of French Regular infantry and Compagnies Franches de la Marine arrived as well -- these are nicely cast 28mm, however in comparison to North Star and Galloping Major they are on the smaller size for sure. I won't buy anymore of these figures, and stick to mostly Galloping Major minis with North Star thrown in. 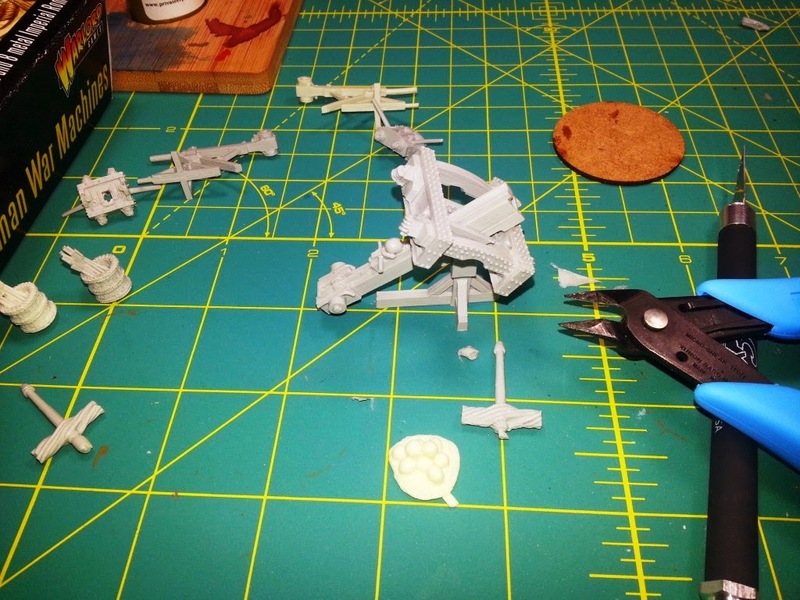 Like I said already, I do want to purchase a few Perry, AW, and Redoubt minis for comparison. I also ordered a handful of nice 100mm wire for flag & guidon poles from North Star. Conquest Miniatures Indians are also on the smallish side of 28mm. I bought a box of the Woodland Indian Party on eBay and the special edition mini of "Magua" (directly from Conquest which is really a part of Warlord Games apparently) from the excellent 1992 movie remake with Daniel Day-Lewis of The Last of the Mohicans. These are Huron and Ottawa Indians that fought for the French side during the FIW along side General Montcalm's forces and the Canadian milice (militia) irregulars. Lastly, the re-do of my missing Wargames Foundry (WGF) box arrived with my order of 300 EIR shields and several Pila. This is a mound of shields and will allow me to outfit my entire EIR Cohort with all of the same shields -- which I prefer over Aventine, Gripping Beast and Warlord Games (WLG) shields. 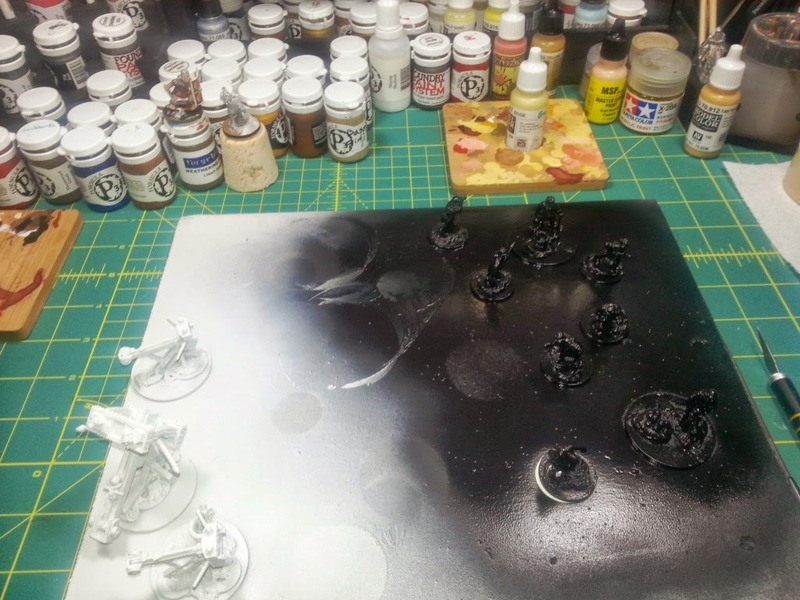 I use a little dish soap and hot water with a toothbrush to remove any left over casting related residue prior to priming all my minis. 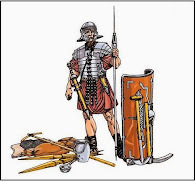 I was able to pick this box set of Warlord Games Roman War Machines on eBay for almost a 30% discount off the WLG website U.S. price. I am sorting out the bits and pieces and see the resin parts are detailed pretty well, but fit concerns me. 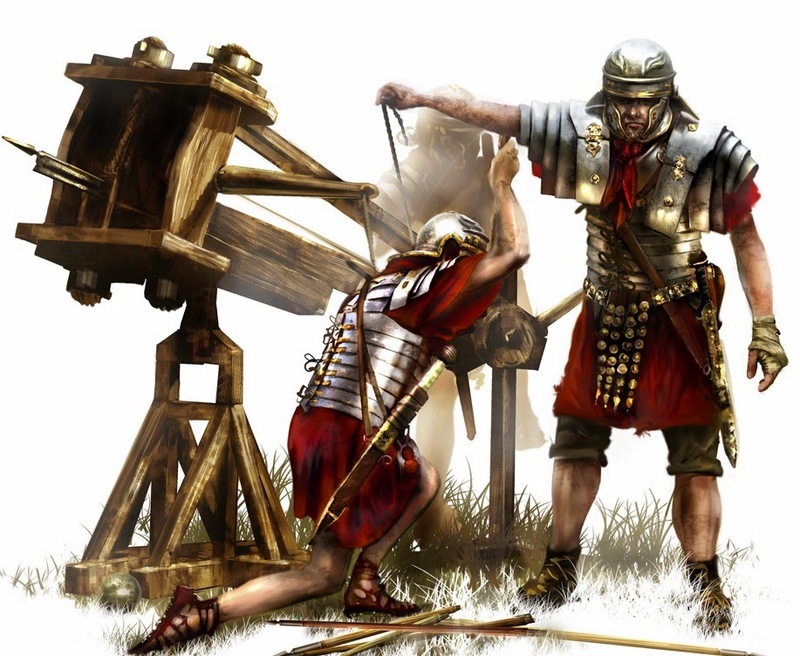 I start on the large Roman Ballista -- sorting through the assorted parts and cleaning up mold lines/clipping off extra plastic and testing the fit. I instantly see that the left torsion bar and rope piece is molded to small and doesn't reach the top of the stanchion frame when fitted. 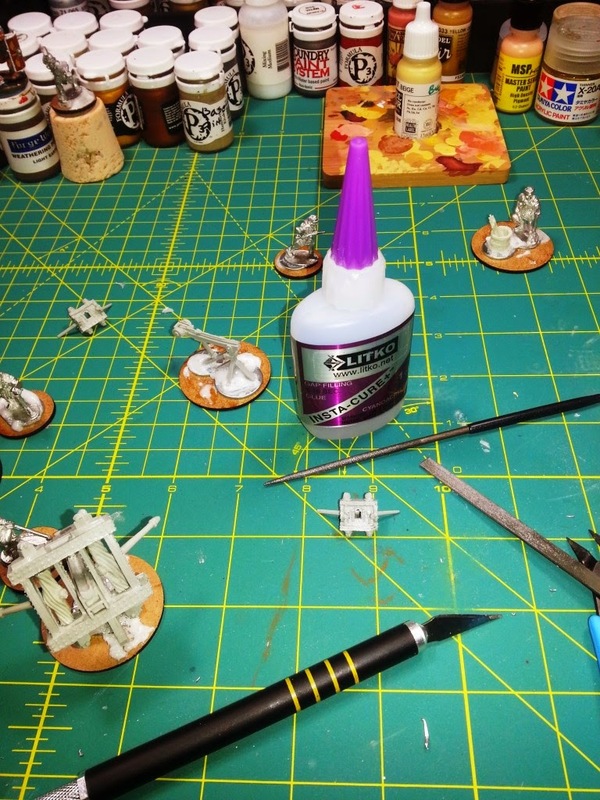 I use gap-filling CA glue to make up the difference with CA insta-set spray. 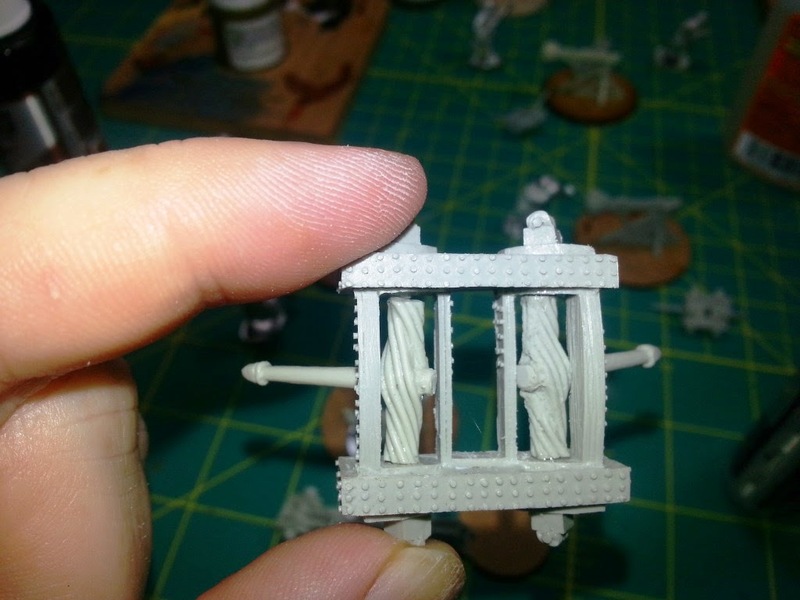 I will use nylon bristles off a large house-hold paint brush for the draw-ropes later on for the war machines (during painting). I sort the metal figures included with the WLG box set, as well as adding two minis from the Wargames Foundry's Scorpion set. 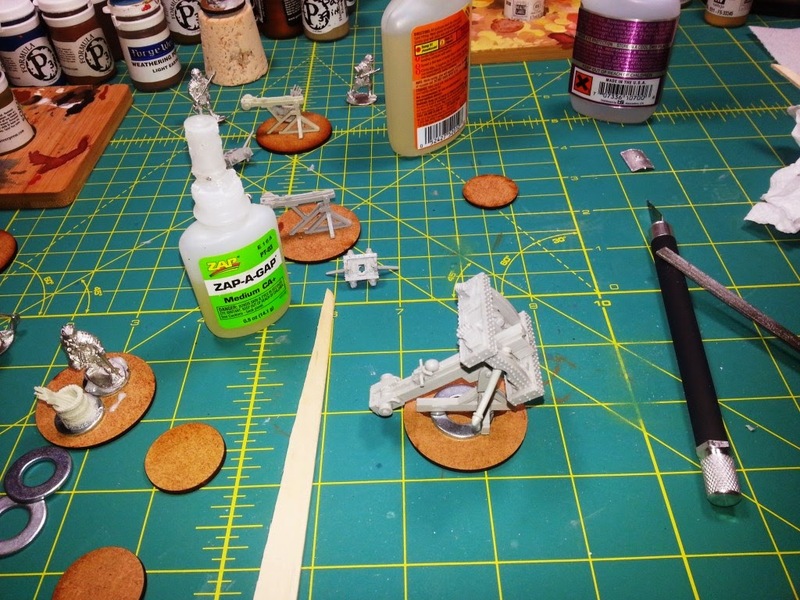 I'm basing the war machines on 2mm MDF 40mm round bases (from the always excellent Warbases.com), using my standard Gorilla Glue and metal washer method. 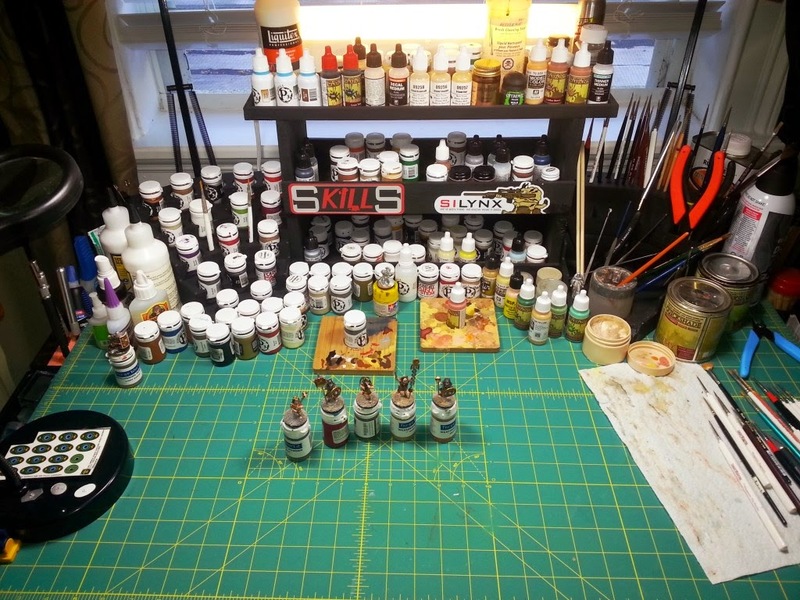 I always create two 40mm round base scenes with minis and ammunition for the re-loaders. 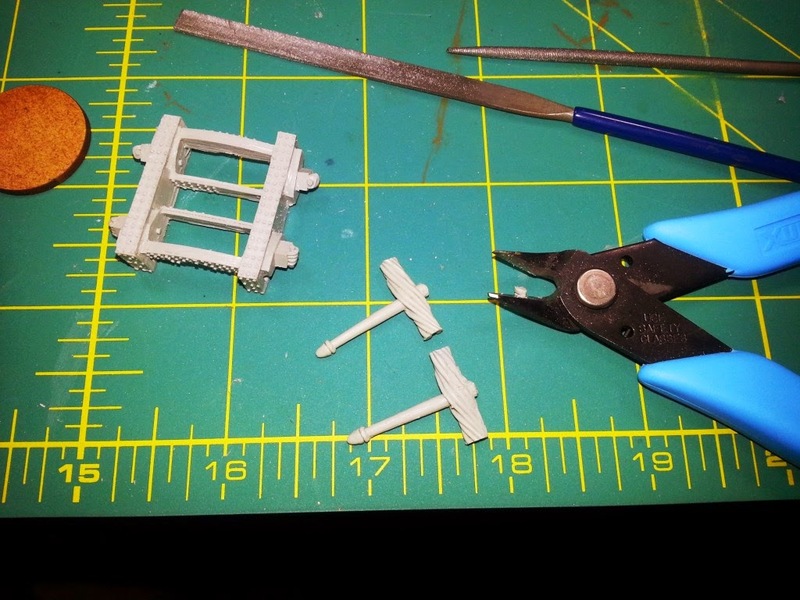 I file and scrap mold lines and flash off the front of the Scorpion stanchion frames. Once again WLG did a poor job with these pieces as they don't fit correctly onto the slider rail. So I had to improvise and CA glue them in place as best I could. Typically you'd want the slider rail to protrude forward slightly from the stanchion frame as the prototypes do, but this isn't possible from what I see due to WLG's poor resin molding and fit. 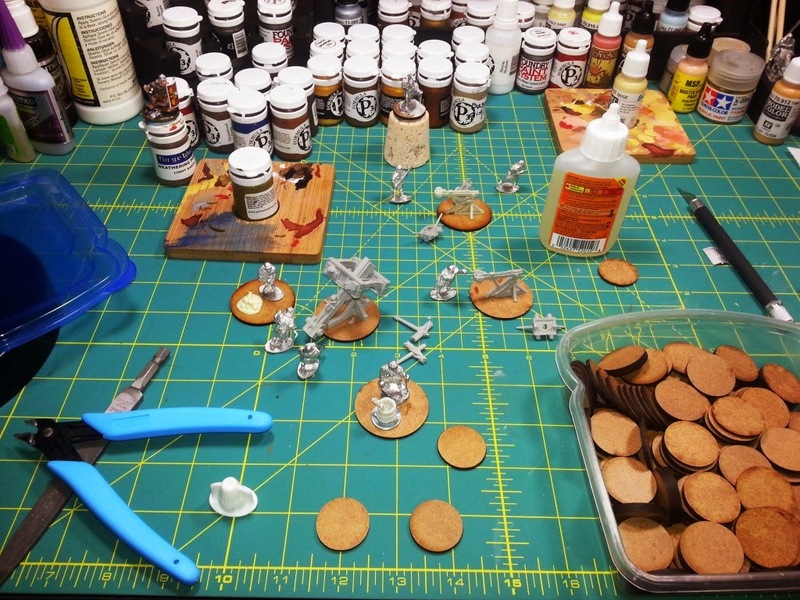 I prep up the figures and war machines once the bases are dry for priming. 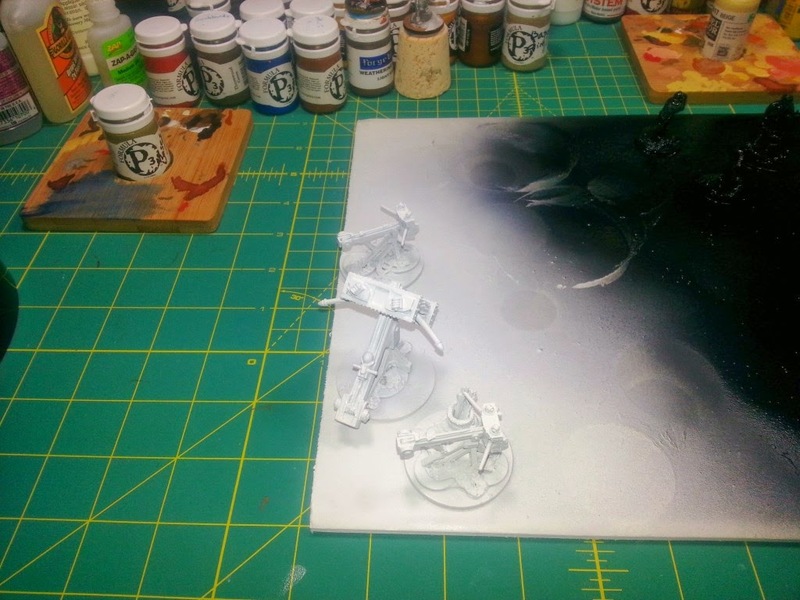 Minis are primed my standard P3 Black Primer and the war machines are primed P3 White Primer (as I want to work on wood grain for these later). 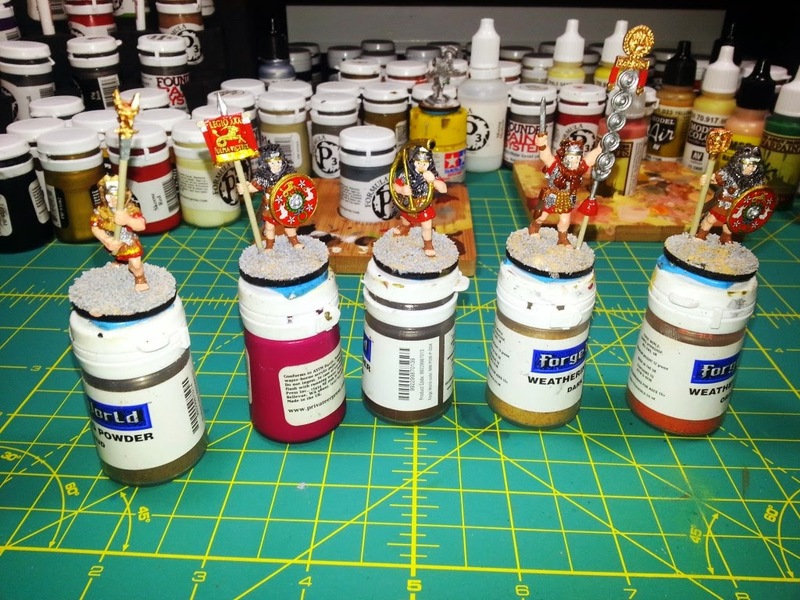 Completed: EIR Legion Standard Bearer Group! 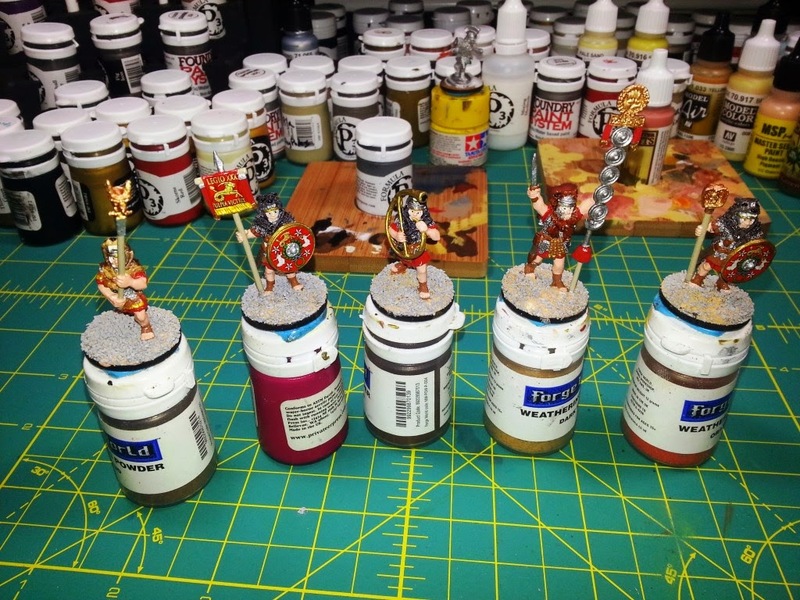 I really liked this mix of Warlord Games (WLG) and Wargames Foundry (WGF) EIR Legion Standard Bearers (with Aventine round shields and LBMS decals). They were fun to paint and I'm happy with the results. Enjoy! 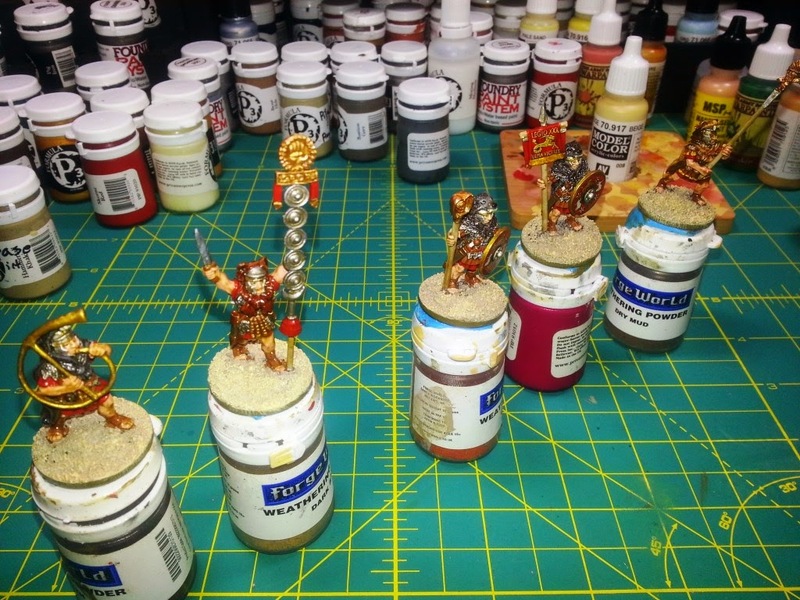 Finishing up: EIR Legion Standard Bearers! Finishing up the group of EIR Legion Standard Bearers is a lot of fun because they are such unique minis with lots of character and animal pelts--Bears, Lions, Wolves! Once all the mini's painting and gloss protective varnish was done and I'm satisfied with the job I've done, I now apply the "ground cover" to the base with a mix of HO railroad ballast and fine grit from G9. 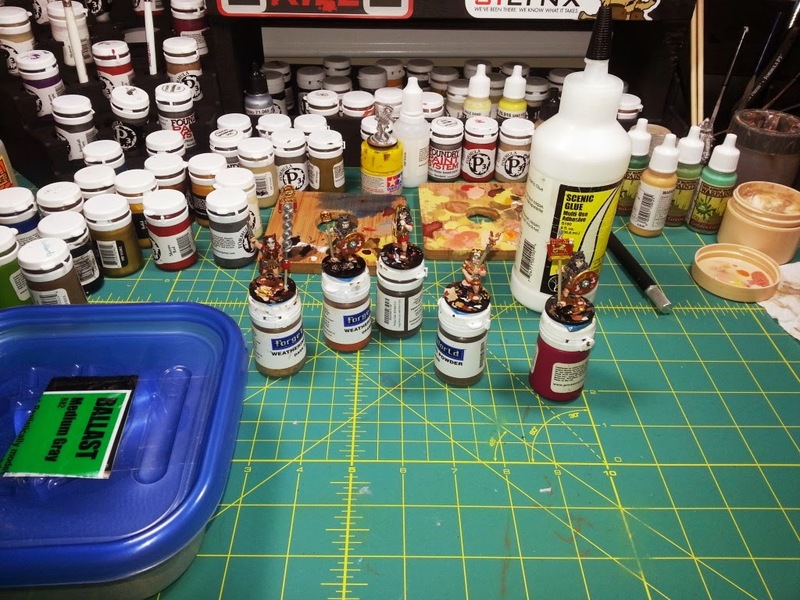 I apply straight scenic PVA glue and then using a shot glass I pour the ballast mix on to the gluey base. I shake of the excess and wipe the edges of the 2mm thick MDF round base (25mm) to remove stray glue and ballast. 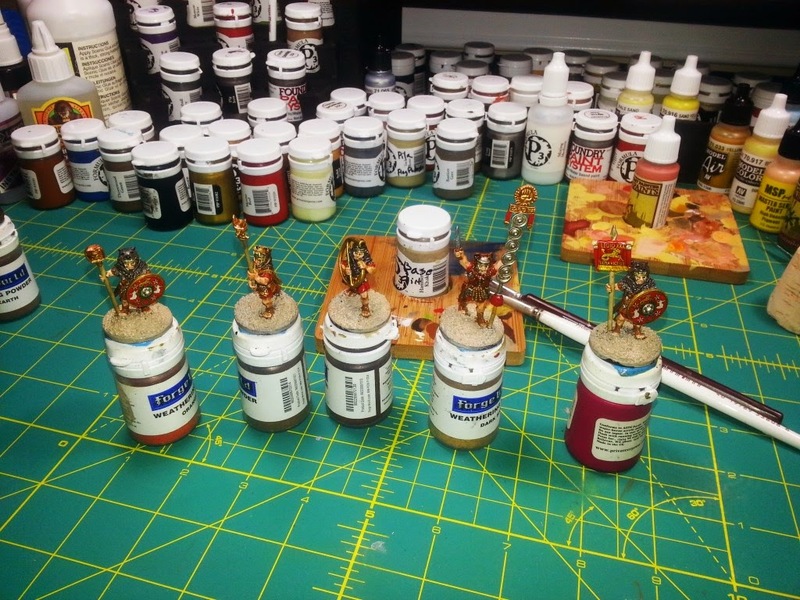 Next I prep the dip (warm water soak) and apply it to the figures. I stir it really well and always use an older set of brush. I have the mineral spirits standing by. 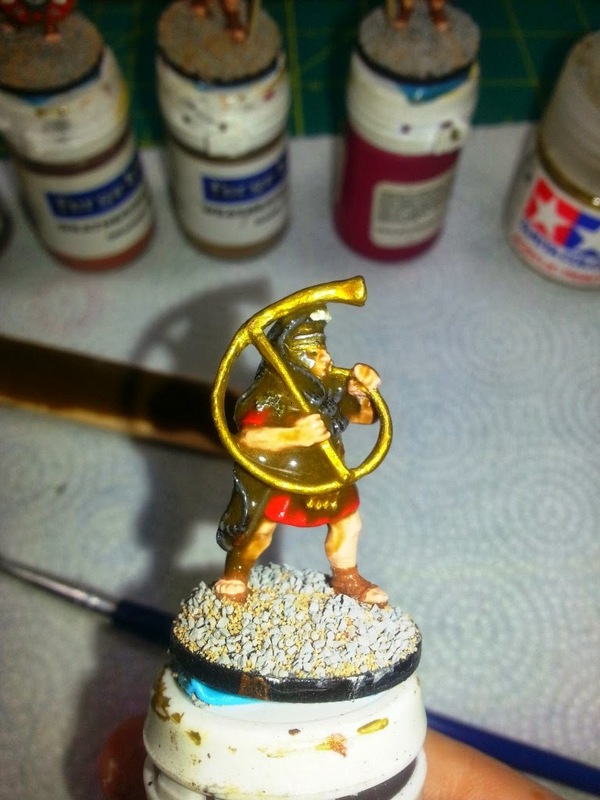 The key for me is to apply the Army Painter Quick Shade "dip" varnish really thick in the folds and corners of the mini and then let it run down of the rest of the figure. After 5 minutes or so I remove the excess dip with the mineral spirits (as I explained in my Primus Pilus tutorial). 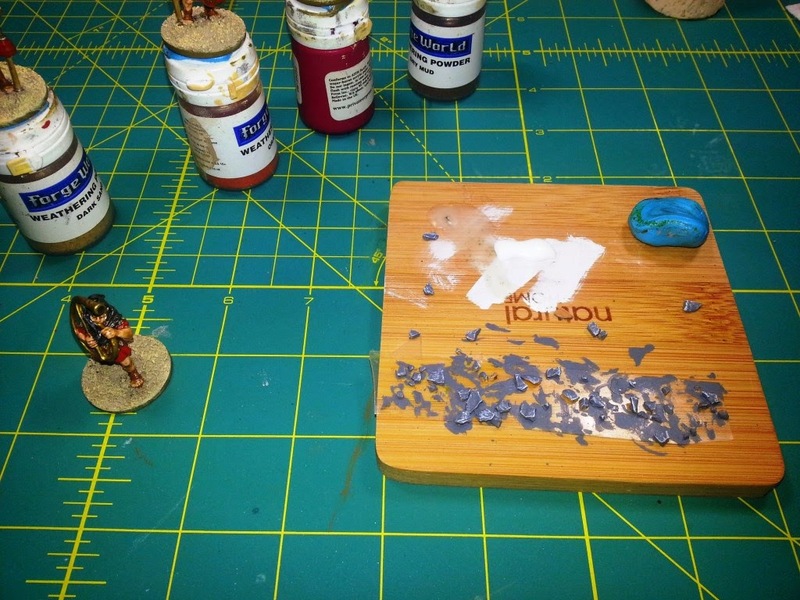 This gives me a lot more control over how I let the varnish dip dry on the mini instead of the recommended shaking off of the excess dip (which not only makes a mess but is to random for my tastes). 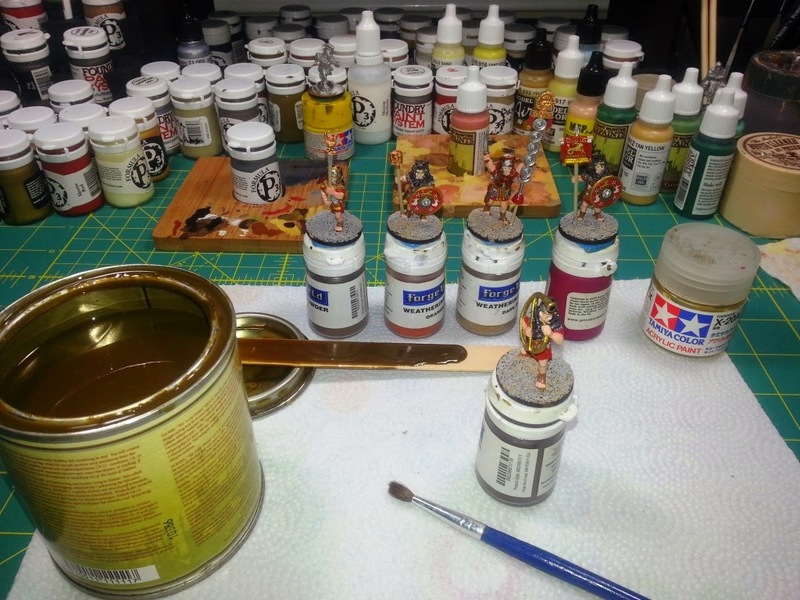 I paint the base ground cover after the dip varnish has mostly dried using P3's Hammerfall Khaki as the main layer and then drybrush it with a variety of Vallejo Beige and Yellow Tan paints. One of my last steps as I finish up the figure is to apply a small stone or two to the base. I have odd shaped talus that I paint grey and then dry brush with straight white to make the small stones really stand out. 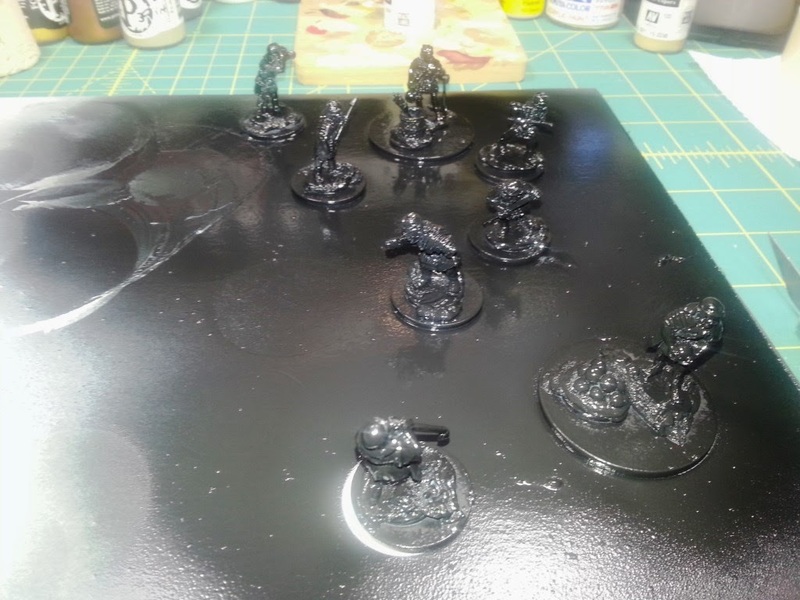 I ran into my first really bad "frosting" problem when I sprayed them with Army Painter Anti-Shine matte coating on these minis. It was really bad on the Cornicen and the Eagle carrier. I tried a second coat after shaking the can for a very long time, but it was still frosted and white-dotted. After a quick search on the excellent TMP Forums, I found the olive oil solution thread and gave it a go. And it worked...sort of. It looked "oily" of course after I applied it, so I had to re-touch up with liquid matte varnish. With the potential to ruin a lot of my painting efforts if this happens again, I think I might switch to the paint-on application of Testors Dull Cote liquid matte varnish in the future. Shields Up... Hold the Line!